Be 100% certain that your school is fully compliant with current health & safety laws. Safesmart is working closely with many schools around the United Kingdom because we are aware about how difficult it can be to ensure your school is fully compliant with fire safety and health & safety legislation as well as further regulatory requirements in the education sector. Too often things slip through the net when you’re busy managing a school, but there is an obligation to staff and pupils alike to make sure that compliance isn’t one of those things. Safesmart’s Smartlog 4 Schools online software system provides a useful tool and compliance safeguard. Used by schools, academies, colleges, nurseries and universities across the UK, Smartlog software makes managing fire safety and health & safety compliance simple, more efficient and inexpensive. In brief, the Smartlog platform lets you put all your compliance requirements in one place. Safesmart understands the dynamic nature of school site and teaching staff employment – brand new, temporary, contractual, and retiring staff are a natural part of education; therefore Smartlog 4 Schools is both an advanced but affordable fixed-fee software for unlimited users. • Unlimited number of users – Unlimited staff users per site, all with full access to features and training courses. • Self-monitoring Risk Assessments – Fire, COSHH, Asbestos, Legionella, Work Place Safety Inspections, Agency Workers and DSE Assessments. Custom real-time interactive assessments can also be created. • Audit Trail – Alert system means you will never miss an important issue again, and after you are assessed you retain proof of who did what and when it was done. Every action is time stamped for precise reference. • Document Management – Share policy & procedure documents across all members of staff. Host a library of forms and guidance/procedures (Fire and Health & Safety). Upload any documents that you wish to share with your staff. • Automated checks and tests – Automatic reminders with a management escalation facility. When a staff member is assigned a task, Smartlog will alert them of what needs to be done and when. There are levels of escalation through management in order to ensure that important tasks are never missed. 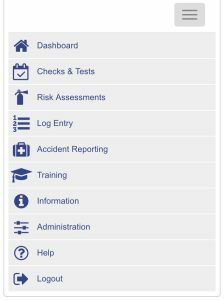 • Free Support – A dedicated account manager for your Smartlog account, responsive online and telephone support for further health & safety and fire safety queries at no additional charge. A free Smartlog iOS app is also available for your added convenience so that Risk Assessments and Checks & Tests can be completed without the need of Internet, Wi-Fi, 3G or 4G, and then synchronised once your device gets connected to the internet again. Can I be certain that my school isn’t paying too much to be compliant? We know how expensive the costs of compliance can be, and how cost cutting is paramount at the moment. We can significantly reduce your servicing & maintenance costs and break down all those costs for you so you know exactly what you are being charged for – no more hidden charges. Currently with Safesmart, the average secondary school can save up to £2650 every year on servicing and maintenance alone. Smartlog 4 Schools software provides all of your fire awareness and fire warden training for all staff, and many other courses. This is in addition to providing interactive templates for self monitoring risk assessments for fire, health & safety and any other choice assessments. Can I be certain that my school is being given the right help and advice? As a Smartlog 4 Schools account holder, Safesmart will provide you with telephone and email support at no additional cost, and will try to make sure that you have all the information you need to make the correct decisions when it comes to compliance. If you do need a consultant to visit your school, we will ensure that our pricing is affordable. All of our experienced consultants are more than happy to give you valuable advice on fire and health & safety legislation.